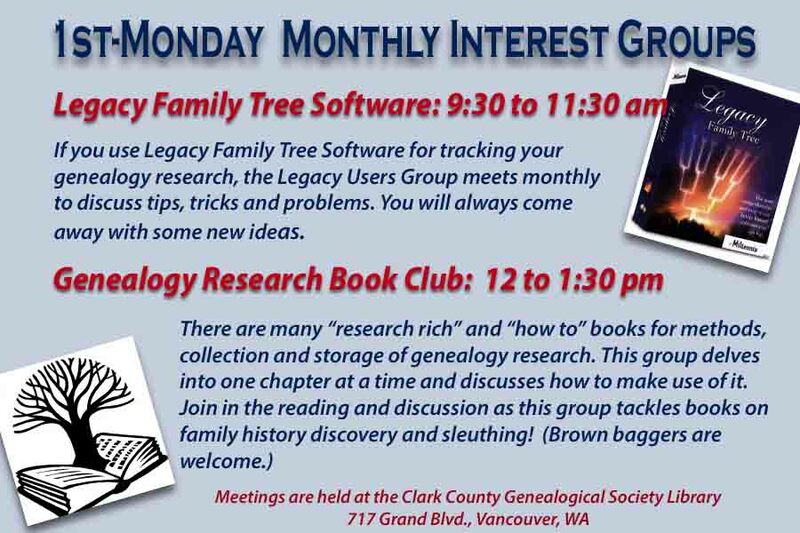 If you use Legacy Family Tree Software for tracking your genealogy research, there is a Legacy Users Group that meets monthly to discuss tips, tricks and problems. You will always come away with some new ideas. The meetings are held regularly on the first Monday of the month. Members and non-members are welcome. This class starts your family tree research with a begin at the beginning strategy. 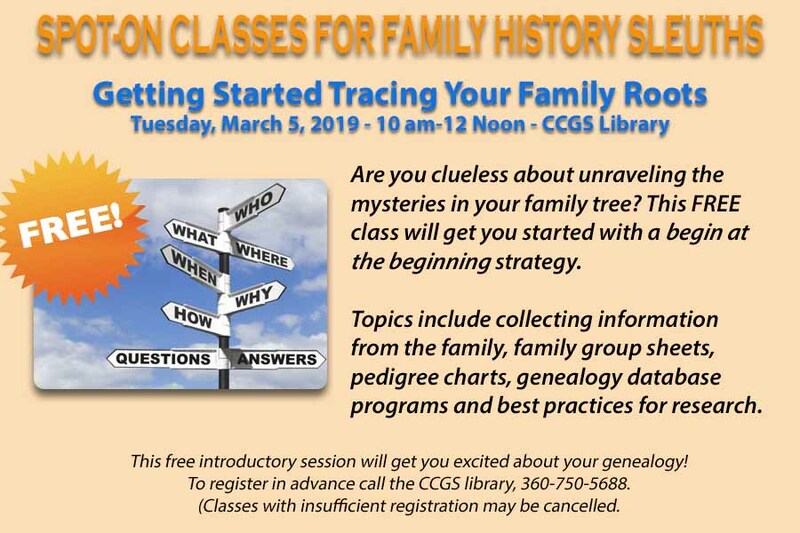 Topics will include collecting information from the family, family group sheets, pedigree charts, genealogy database programs, and best research practices. 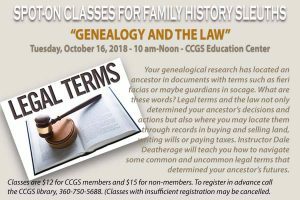 Taught by highly regarded genealogist and CCGS member, Elsie Deatherage. DNA testing companies boast helpful internal tools, but there are many excellent third party tools that can help provide answers. This Legacy Family Tree webinar will provide an overview of all the available third party tools as well as practical hints and tips on how to get the most out of them. 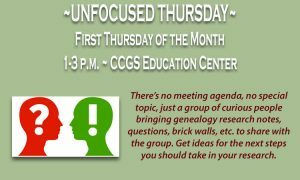 There’s no meeting agenda, no special topic, just a group of curious people bringing genealogy research notes, questions, brick walls, etc. to share with the group. Get ideas for the next steps you should take in your research. WHAT’S NEW ON THE FAMILY SEARCH WEBSITE? 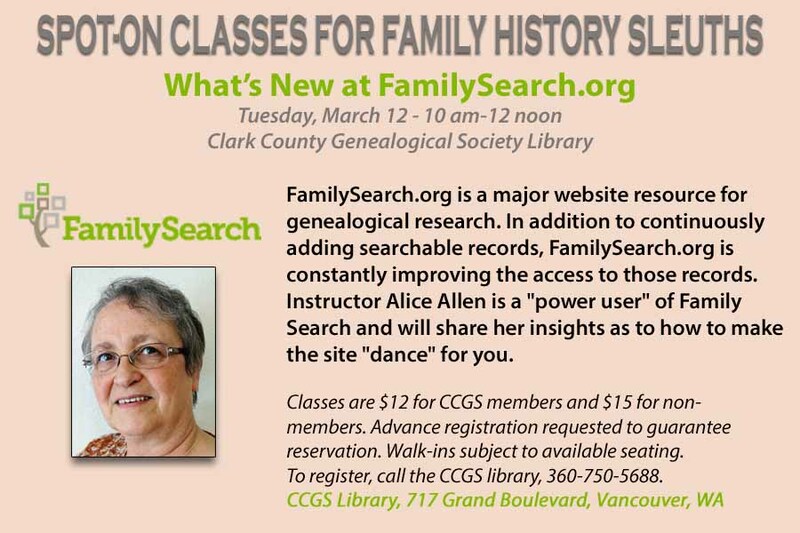 Join Alice Allen to learn about the constantly changing and improving FamilySearch.org website. Find out what’s new and pick up tips and tricks to make your own Family Searching experience a successful one! Advance registration requested as class may be canceled with insufficient registrations. Walk-ins are accepted subject to available seating. 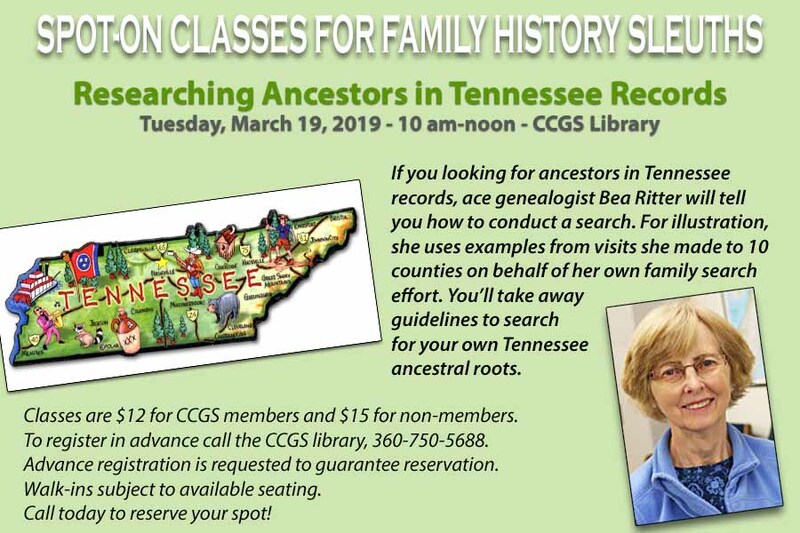 If you looking for ancestors in Tennessee records, ace genealogist Bea Ritter will tell you how to conduct a search. For illustration, she uses examples from visits she made to 10 counties on behalf of her own family search effort. You’ll take away guidelines to search for your own Tennessee ancestral roots. Advance registration is requested to guarantee reservation. Walk-ins subject to available seating. African-Americans throughout the South moved to Midwestern cities in search of opportunities and work. 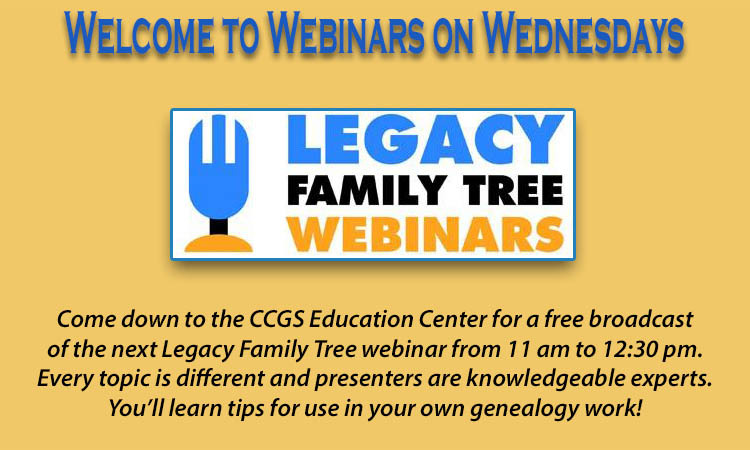 This Legacy Family Tree webinar will help researchers understand how to look for clues in both places and with all connected family members. At the height of activity for the Hudson’s Bay Company at Fort Vancouver, American wagon trains began rolling west. At Fort Vancouver, the Native American and Hawaiian populations were permanent residents with fur traders, clerks and officers of the HBC. 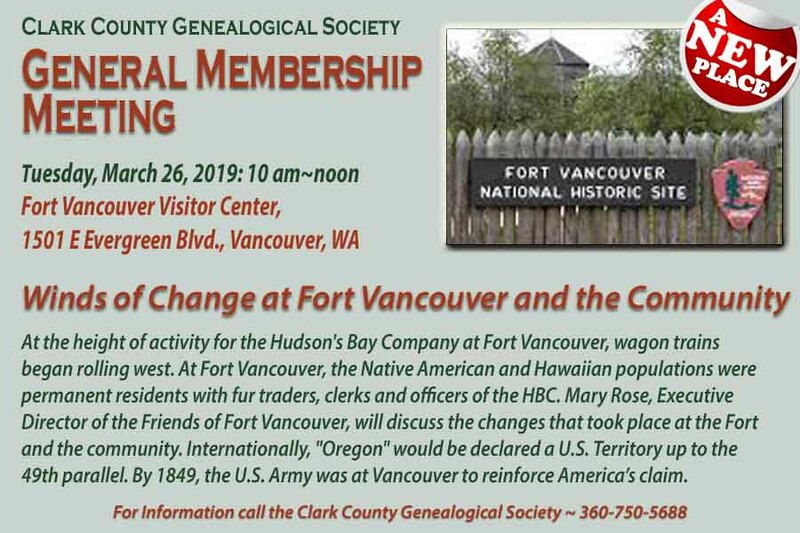 Mary Rose, executive Director of the Friends of Fort Vancouver, will talk about the changes that took place at the Fort and the community. Internationally, “Oregon” would be declared a U.S. Territory up to the 49th Parallel. By 1849, the U.S. Army was at Vancouver to reinforce America’s claim. There are several new applications and a few old ones which can help you capture, reference, and share your family history on the go. Come find out how to use the latest and greatest tools for your preferred Apple mobile device at this Legacy Family Tree webinar. Who was Captain Thomas Hamilton? Y-DNA solves a 300-year old mystery of his origins. 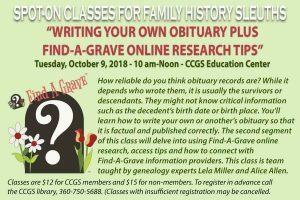 Using the Genealogical Proof Standard as well as DNA evidence, the instructor in this Legacy Family Tree webinar describes how the mystery is solved. Types of testing will be covered and how DNA can solve family mysteries. 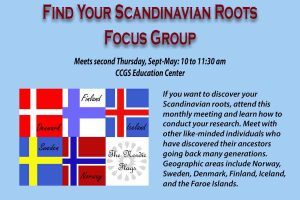 If you want to discover your Scandinavian roots, come to this interest group and be inspired. You’ll get tips for conducting research and finding cousins. 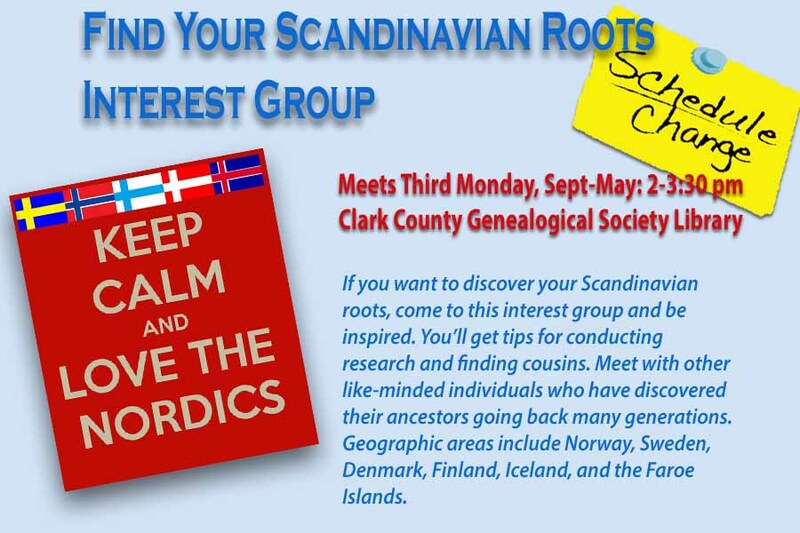 Meet with other like-minded individuals who have discovered their ancestors going back many generations. Geographic areas include Norway, Sweden, Denmark, Finland, Iceland, and the Faroe Islands. French genealogy researchers benefit from some of the most complete, detailed, and well-preserved records in the world. Due to the digitization efforts, records commonly used for French genealogy are also among the most accessible. 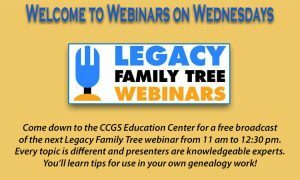 In this first of a three-part Legacy Family Tree webinar series, explore the record sets most commonly found online. How much do you know about the War of 1812? What was it about, what did it accomplish, and how can you find the records of those who served? 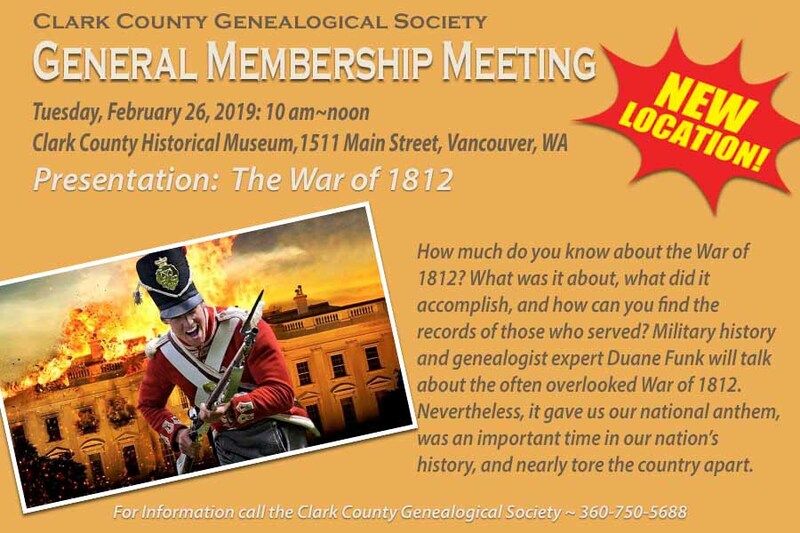 Military history and genealogist expert Duane Funk will talk about the often overlooked War of 1812. Nevertheless, it gave us our national anthem, was an important time in our nation’s history, and nearly tore the country apart. Take a trip with spreadsheets to the lands of your ancestors. In this Legacy Family Tree Webinar, learn how spreadsheets can help as you learn to read foreign language newspapers or serve as a translation tool for your ancestors’ vital and religious records. Create spreadsheets to track your ancestors and those great ethnic or locality websites. their favorite topic of books on family history discovery and sleuthing. some of those resources for your family history research. non-members. To register in advance call the CCGS library, 360-750-5688. (Classes with insufficient registration may be cancelled. individuals who have discovered their ancestors going back many generations. month, September-May. Members and non-members are welcome. such as fieri facias or maybe guardians in socage. What are these words? for non-members. To register in advance call the CCGS library, 360-750-5688.
the desire to have a better life; an event that lasted seven short years. 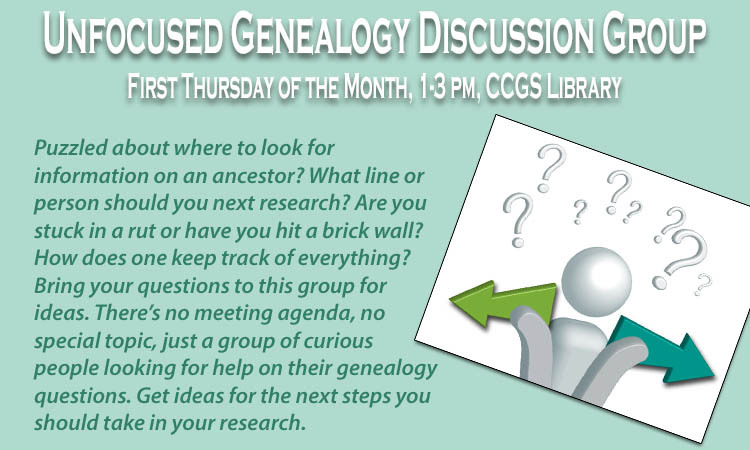 knowledgeable librarians who can help you with your family history search. AmericanAncestors.com. Bring your own computer and use our free wifi. FamilySearch.org recently added their two billionth image to their website. and how to access them. 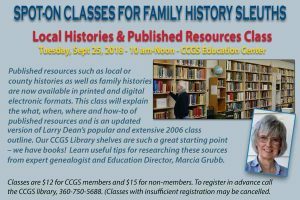 your family history in this class taught by CCGS president, Brian Runyan. history. French Canadians arrived via river travel between 1764 and 1803. With statehood in 1821, more settlers seeking land arrived from the east. 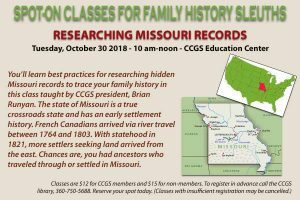 Chances are, you had ancestors who traveled through or settled in Missouri. Privacy remains a huge issue for many genealogists and their family members. collaborative genealogy platforms, these questions are becoming more common. Whether you are new to genealogy or you’ve been working on your family history for years, incorporating the research of others can always be tricky. Here’s how to develop a proven strategy to benefit from the work of other genealogists. 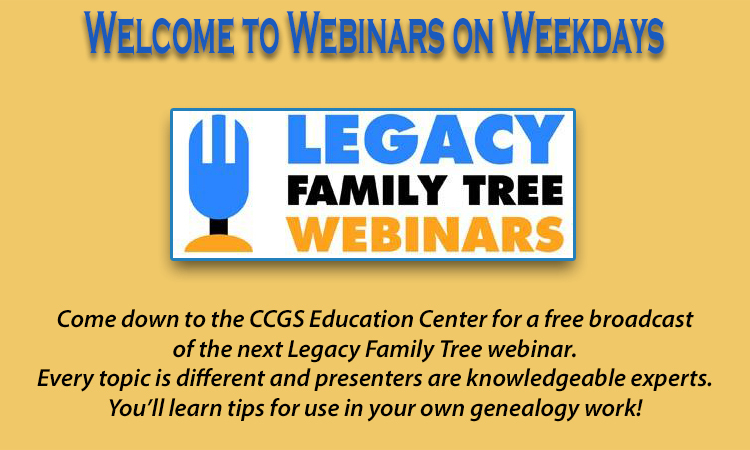 This Legacy Family Tree webinar is presented by Thomas MacEntee, a genealogy professional, blogger, educator, author, and social media connector. Are you clueless about unraveling the mysteries in your family tree? This class will get you started with a begin at the beginning strategy. 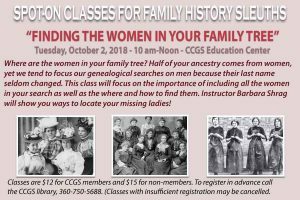 Topics include collecting information from the family, family group sheets, pedigree charts, genealogy database programs and best practices for research. 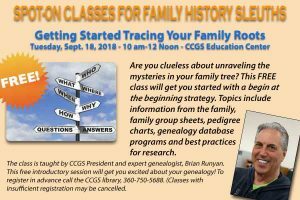 This free introductory class is taught by CCGS president and expert genealogist, Brian Runyan. Whether you are searching online databases, trying to obtain information from an uncooperative cousin, or need to streamline your research workflow, this webinar will outline 25 simple hacks you can use to get more genealogy done in less time! This Legacy Family Tree webinar is taught by Lisa Alzo, MFA, who is an internationally recognized lecturer and author. Researching slave ancestors overseas can be challenging due to naming and record-keeping practices. 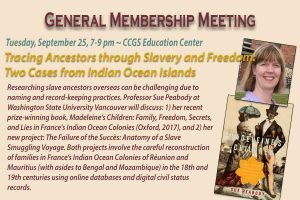 Professor Sue Peabody at Washington State University Vancouver will discuss two projects: 1) her recent prize-winning book, Madeleine’s Children: Family, Freedom, Secrets, and Lies in France’s Indian Ocean Colonies (Oxford, 2017), and 2) her new project: The Failure of the Succès: Anatomy of a Slave Smuggling Voyage. Both projects involve the careful reconstruction of families in France’s Indian Ocean Colonies of Réunion and Mauritius (with asides to Bengal and Mozambique) in the eighteenth and nineteenth centuries using online databases and digital civil status records. 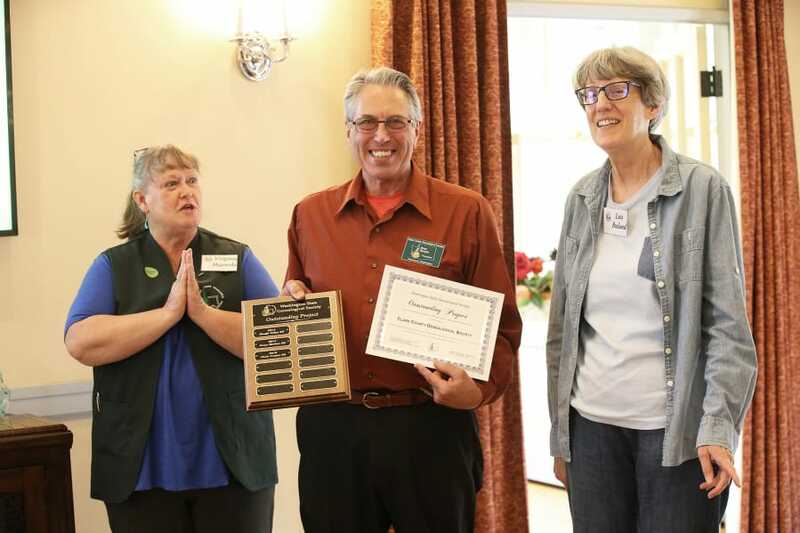 The Olympia Genealogical Society and Clark County Genealogical Society earned outstanding society awards at the WSGS Annual Meeting and Awards Ceremony on May 26 in Vancouver. 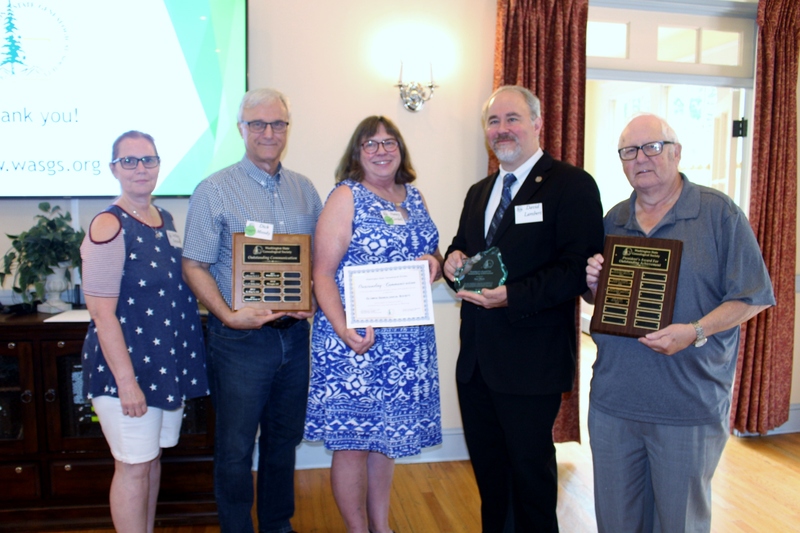 WSGS President Virginia Majewski presented the Outstanding Project Award to CCGS President Brian Runyan and member Lois Bosland. 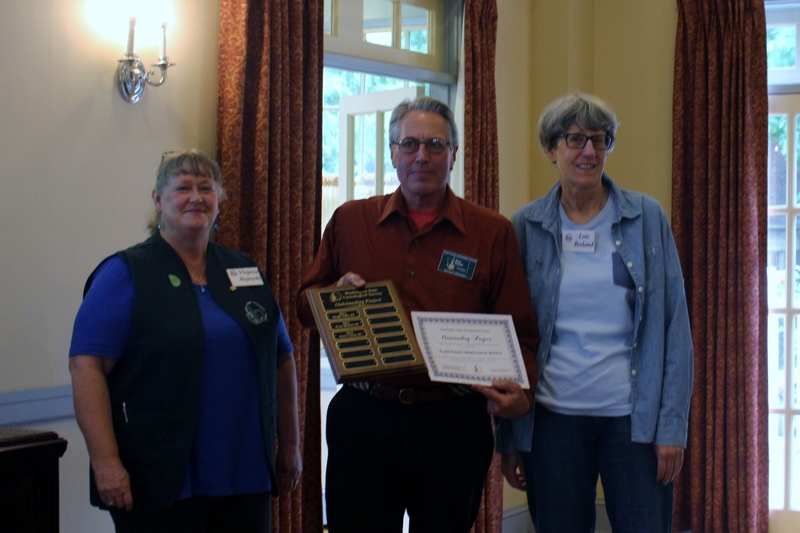 The Clark County Genealogical Society, in addition to being the excellent hosts of the Awards Ceremony, were the recipients of the Outstanding Project Award for their Tax Ledger Project which included digitizing, transcribing and indexing original 1886 and 1891 tax ledgers for the City of Vancouver. As we all know, those are critical years for any family history researcher in lieu of the 1890 census disaster. The tax records included who owned property in Vancouver and how much tax was owed and paid (or not). 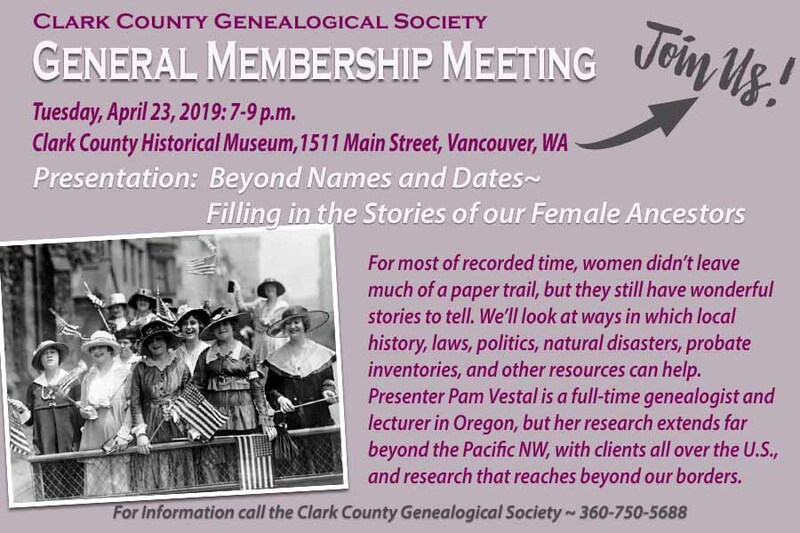 The Clark County Society consulted with the State Archives, Clark County Historical Museum, History Department at WSU Vancouver and the WSU Library – a true collaborative effort. This treasure trove of information is now available to the public and the original records are being turned over to the State Archives. Olympia Gen Soc earned the Outstanding Communication Award for their new website. For 20 years, they used a popular web host that is currently unavailable. Understanding the importance and urgency of getting information out to their members and the public in this web-based world, they created a new website, using a web development company that specializes in genealogical societies (EasyNetSites — same as WSGS). Olympia’s site is attractive – and even better, it’s full of current information. Check out their website here. They also use their Facebook page to regularly post informational tidbits, newsy articles and promote their meetings and seminar. Besides the Outstanding Communication Award, Olympia’s Ann Olsen was awarded the President’s Award for Outstanding Achievement while Rebel Romero received an Outstanding Volunteer award. 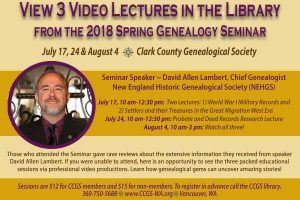 The 2018 Spring Genealogy Seminar featured David Allen Lambert, Chief Genealogist for the New England Historic Genealogical Society. Those who attended the Seminar gave rave reviews for the extensive information packed into three educational sessions. Topics covered are World War I Military Records, Settlers and their Treasures in the Great Migration West Era (shown July 17, 10 am-12:30 pm), and Probate and Deed Records Research (shown July 24, 10 am-12:30 pm). All three are showing on August 4, 10 am-3 pm. If you were unable to attend, here is an opportunity to view the lectures via professional video productions. Each session is $12 for CCGS members and $15 for non-members. 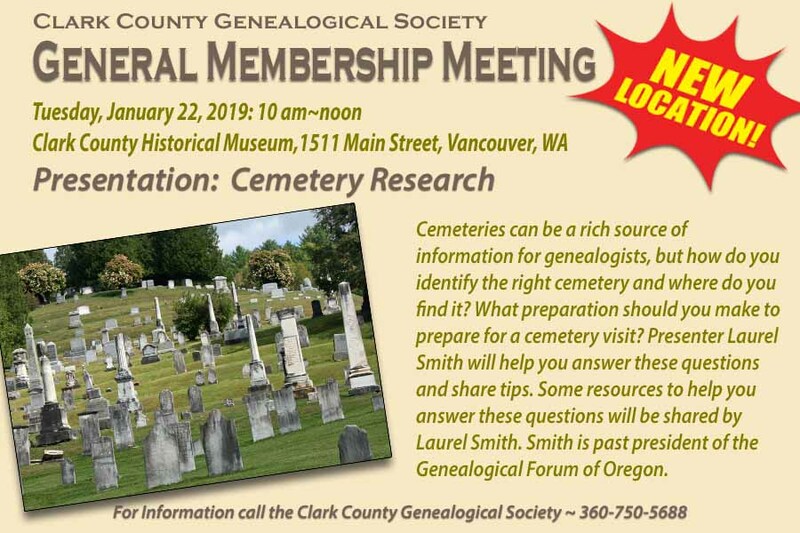 Check the website at www.CCGS-WA.org for more details and registration. This free Legacy Family Tree Webinar will discuss the historic trails and trailblazers that lead early settlers to and from Virginia, North Carolina, Kentucky, Tennessee, and the West. Get specific clues to help you solve difficult research questions. In less than ninety minutes, you will learn the absolute need-to-know tools and skill sets that a photographer needs when using Adobe Photoshop. By the end of this Legacy Family Tree webinar, you will be well on your way to mastering some photo editing techniques that will make your images amazing. Edgewood Park — The Clark County Genealogical Society was awarded the 2018 Outstanding Project Award at the Washington State Genealogical Society’s annual meeting. 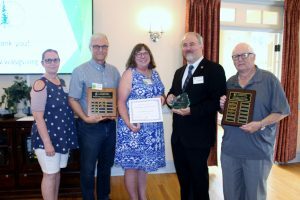 The society earned the award for their project, “Vancouver Tax Ledger Project,” which included digitizing, transcribing and indexing original tax ledgers for the city of Vancouver for the years 1886 and 1891. “Clark County Genealogical Society’s commitment to preserve the 1886 and 1891 tax ledgers is especially valuable considering genealogy researchers might be able to use that information as a substitute for the 1890 federal census which was destroyed by fire in Washington, D.C. in 1921,” Virginia Majewski, president of the state society, said in a release from the Clark County group. 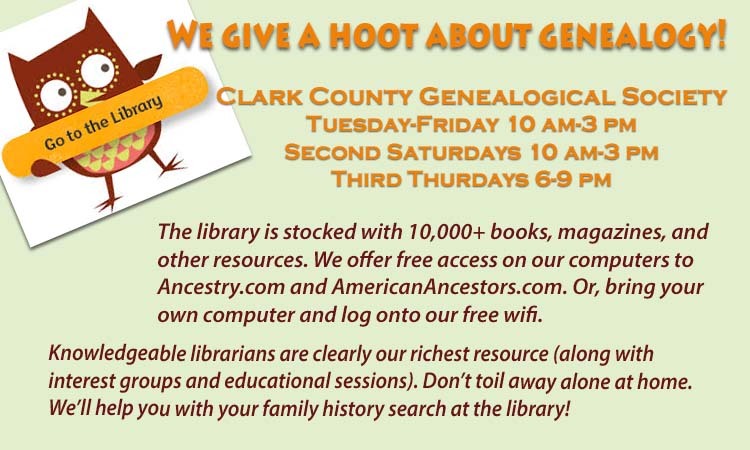 Clark County Genealogical Society is a volunteer-run nonprofit society founded in 1972. It is dedicated to pursuing the collection, preservation and education of genealogically relevant material. CCGS Education Center – Bring a Potluck dish! 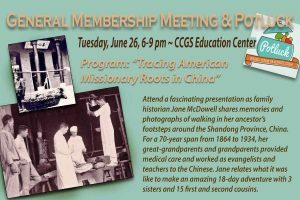 Attend a fascinating presentation as family historian Jane McDowell shares memories and photographs of walking in her ancestor’s footsteps around the Shandong Province, China. For a 70-year span from 1864 to 1934, her great-grandparents and grandparents provided medical care and worked as evangelists and teachers to the Chinese. Jane relates what it was like to make an amazing 18-day adventure with three sisters and 15 first and second cousins. Bring a potluck item to share at this final spring meeting. Many people just don’t understand what tools are available when it comes to editing photos. Within Adobe’s Creative Suite, there are two programs designed specifically with photographers in mind: Adobe Photoshop and Adobe Lightroom. But the truth is, each program offers a distinct post-production photography workflow. In this Legacy Family Tree webinar, learn when you should choose one over the other and why both are important to know and use.